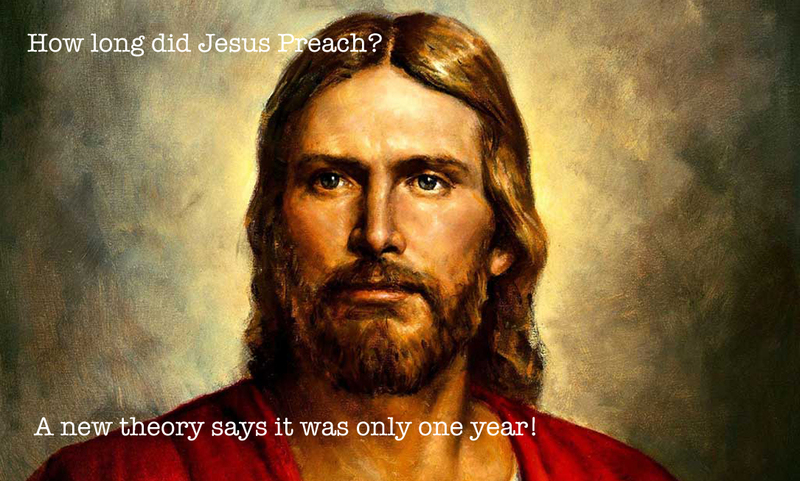 Jesus preached for only one year, not 3½! Some people believe in Jesus (Yahushua). Others claim he didn't even exist. But virtually everyone, no matter how they feel about him, agrees that his public ministry was about 3 or 3½ Years. Everyone, that is, except Matthew, Mark, Luke, and John. Our strategy to determine the chronology is to note that the Hebrew calendar contains various annual religious festivals ("Feasts"), three of which (shown in red below) required mandatory attendance by all Jewish men at Jerusalem. we will discover that his public ministry was about one year long. (Further investigation reveals that the entire length, including the 40 days fast in the wilderness and 50 days until Pentecost, is exactly 490 days. However, that exercise is beyond the scope of this article. reference). An introduction, consisting of a genealogy of Yahushua and some background history. A detailed eyewitness account by the narrator, which begins at a certain point in Yahushua's ministry when the narrator becomes personally involved. Matthew used history from other witnesses concerning the birth of Yahushua, but his own eyewitness observations from observing Yahushua in Galilee, and then in more detail after he became a disciple. Since he is concerned with the laws of the Kingdom, his report is not always chronological, but he groups things according to theme. Mark got his details from Peter, and, after the introduction, gives an account following Peter's acceptance of the call to be a "fisher of men". Luke compiled his account from other witnesses, and thus includes many other details, for example, on the birth of John the Baptist. Luke's gospel is generally chronological. John was an eyewitness, and only wrote what he directly saw (except for the brief introductory account). He was a disciple of John the Baptist, and followed Yahushua from that time onward; he presents a chronological account. Since John presents a chronological account starting at the beginning, we will go there now. 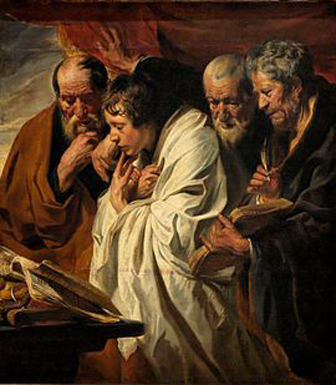 After his introduction from John 1:1-14, the gospel begins with the testimony of John the Baptist to the priests and Levites from Jerusalem, John 1:19. John is giving his testimony at the same time that Yahushua is being tempted in the wilderness near the end of his 40-day fast. We read that "the next day", after speaking with the Pharisees, he saw Yahushua coming towards him and called out "Behold the Lamb!" (verse 29) Yahushua was returning from the wilderness. This day in verse 29 is the first day of the Jewish year, and begins "The Year of favor of the LORD" (Isaiah 61:2). John repeats his "Behold the Lamb!" proclamation "the next day" (verse 35), being now two days after John's testimony to the priests in verse 19. Andrew and John then follow Yahushua; Andrew gets his brother Simon (Peter), and then on the "day following" (verse 43), Yahushua finds Philip, who gets Nathaniel. They all leave Bethsaida, travel a day, and then on the "third day", they all go to the wedding at Cana -- (John 2:1). Here is a timeline of the first week. It is a foretaste of the busy schedule Yahushua will follow. It is now time for the Passover, which is 14 days after the beginning of the year; it is two weeks after John announced "The Lamb". Arriving in Jerusalem, he prepares for the Passover by expelling the money changers from the Temple (verse 14), and when the priests ask for a sign, he introduces the prophetic statement "destroy this Temple and in three days I will raise it up" (verse 19). Nicodemus, a Pharisee, witnesses this event, and comes to Yahushua at night during the week of unleavened bread connected with the Passover. Afterwards, Yahushua and the disciples went into Judea where John was baptizing, John 3:22. John continues baptizing; it has only been a few weeks since he said "Behold the Lamb". In John 3:25, an argument develops between John's disciples and Yahushua's disciples about ceremonial washing. Why? Because of the recent miracle of turning the water to wine, which had defiled the Pharisees' ceremonial washing vessels. Yahushua's disciples, and also John, continue to baptize, but when Yahushua finds out that the Pharisees are on his case, John 4:1-3, he heads towards Galilee, passing first through Samaria (John 4:3-4). At Samaria, he meets the woman at the well, and then with the entire town (John 4:5-42), and stays there for two days (verse 40). He even tells them that he is the Messiah (verses 26, 42). Finally, in verse 43, he continues his journey to Galilee. This could be the time of his rejection at Nazareth (verse 44). The Galileans received him since they had seen the things he had done in Jerusalem at the Feast of Passover (verse 45), which was just a few weeks before. In verse 46, he comes again to Galilee "where he had made the water wine" and heals the nobleman's son (John 4:46-53). It's been less than two months since John announced "The Lamb". The next thing we see is "a feast of the Jews", and Yahushua goes to Jerusalem (John 5:1). What feast is this? Many people believe this to be the next Passover. But we see that it's only been less than two months since the last Passover. The result is that they want to kill Yahushua. John the Baptist (not John the Gospel writer) is put into prison; when Yahushua finds out, he heads off to Galilee. Apparently, at this time John also goes back to Galilee to join his brother and father in their fishing business. So John does not narrate his eyewitness Gospel account while he is out fishing. Matthew, Mark, and Luke, however, cover this period. John rejoins Yahushua and Simon Peter in Galilee at the event known as the "Call by the Sea" where those disciples make a commitment to become "fishers of men". (see Matthew 4:18-22, Mark 1:16-20, and Luke 5:1-11.) Mark's Gospel, based on eyewitness information from Simon Peter, begins in full detail here. Matthew and Luke also cover this period. Although Levi-Matthew's formal call at the tax booth did not occur until slightly later, Matthew himself, residing in Galilee had heard and observed Yahushua prior to this. Luke apparently got information from many sources. During the Transfiguration, Peter makes a remark about building three tabernacles because the Feast of Tabernacles is coming up in five days, on the fifteenth day of the seventh month. This feast does require attendance at Jerusalem, and Yahushua heads there secretly, because he knows that the religious leaders want to kill him. However, once there among the crowds, he heals a blind man and teaches the people, John 7:14-52. It's already halfway through the seventh month and heading towards winter. Yahushua sends out the seventy, and then goes to Jerusalem for the "Feast of Dedication" ("Hanukkah"), which begins on the 25th day of the ninth month. The religious leaders try to stone him, but Yahushua escapes. So that's it. Four gospel accounts. Two Passovers. A one year ministry - "The Year of Favor of the LORD". The Gospels, as documented by Matthew, Mark, Luke, and John, describe a public ministry of Yahushua ("Jesus") of about one year. It not is 3 ½ years with huge gaps in time where not one of the four writers (each of which had a different viewpoint) saw anything worth recording. As an observant Jew, and the Jewish Messiah, he observed the Torah. Isn't a year is too short to do all the things in the Gospels? As an example, consider that there are about 35 miracles reported in the four Gospel records. Note: Things like the healing of the Ten Lepers is counted as one miracle, because they were all healed at the same time. Assuming a ministry of exactly one year, this is 365 / 35 = 10 days between miracles. In other words, one miracle every 10 days. If the ministry was 3½ years, then that would be one miracle every 36 days. A similar exercise can be done with all the parables recorded in the 4 Gospels, of which there are 40. Assuming a ministry of exactly one year, this is 365 / 40 = 9 or one parable every 9 days. If the ministry was 3½ years, then that would be one parable every 32 days. "one year" is one miracle or parable every 9 or 10 days. Is that too rushed a schedule? "three and one half years" is less than one miracle or parable per month. What was he doing the rest of the time? all happened in a journey towards Jerusalem a few weeks before the final Passover. What about the "Passover" in John 6:4? Yahushua is in Galilee, not Jerusalem attending the Passover as he should, and neither are the disciples and multitudes. The chronology preceding John 6:4, and after it, indicate that the feast is Trumpets, not Passover. This would indicate a wide gap. If you think that John 5:1 is also Passover, then it's even worse - there would be an entire year between the healing at the pool / rejection by the Sanhedrin (the only events in chapter 5) and the next chapter 6. Of course, you need those gaps to stretch one year into something close to 3 ½.
Yahushua feeding the crowd with leavened bread at Passover. Yahushua not attending the Passover, and encouraging others to do likewise. Why can't there be a 3 ½ year ministry? Since John says he didn't write everything (John 21:25), why can't there be a 3 ½ year ministry? Because John has already defined the beginning and end points as Passovers. If you add "gaps", you can only put them in certain places, and adding Passovers will alter the length by "large chunks". There is no way to "fine tune" it to 3 ½ years and still follow the text. Since you can't move the first and last Passovers, the only place you could possibly "fine tune" it is before the first Passover. But the problem with that approach is that time is well detailed by John chapter 1 and 2, and the length of the 40 day fast is detailed by the other three Gospels. 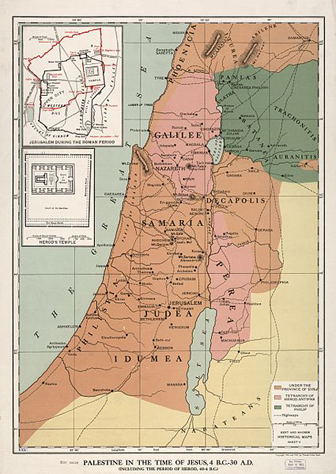 Above: Judea, Galilee and neighboring areas at the time of Jesus. In the Christian gospels, the ministry of Jesus begins with his baptism in the countryside of Roman Judea and Transjordan, near the river Jordan, and ends in Jerusalem, following the Last Supper with his disciples. The Gospel of Luke (3:23) states that Jesus was "about 30 years of age" at the start of his ministry. 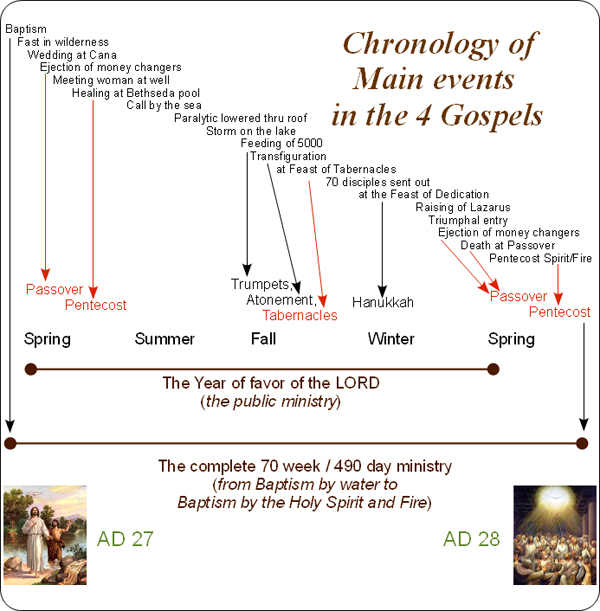 A chronology of Jesus typically has the date of the start of his ministry estimated at around 27-29 AD/CE and the end in the range 30-36 AD/CE. In the Later Judean ministry Jesus starts his final journey to Jerusalem through Judea. As Jesus travels towards Jerusalem, in the Later Perean ministry, about one third the way down from the Sea of Galilee (actually a fresh water lake) along the River Jordan, he returns to the area where he was baptized. A Gospel harmony is an attempt to compile the Christian canonical gospels into a single account. This may take the form either of a single, merged narrative, or a tabular format with one column for each gospel, technically known as a 'synopsis', although the word 'harmony' is often used for both. Harmonies are constructed to establish a chronology of events in the life of Jesus depicted in the canonical gospels, to better understand how the accounts relate to each other, or to establish events in the life of Jesus. The construction of harmonies has always been favoured by more conservative scholars. Students of higher criticism, on the other hand, see the divergences between the Gospel accounts as reflecting the construction of traditions by the early Christian communities. In the modern era, attempts to construct a single story have largely been abandoned in favour of laying out the accounts in parallel columns for comparison, to allow critical study of the differences between them. The earliest known harmony is the Diatessaron by Tatian in the 2nd century and variations based on the Diatessaron continued to appear in the Middle Ages. The 16th century witnessed a major increase in the introduction of Gospel harmonies and the parallel column structure became widespread. At this time visual representations also started appearing, depicting the Life of Christ in terms of a "pictorial gospel harmony", and the trend continued into the 19th-20th centuries.